Any process that requires the use of very low temperature applications, such as food warehousing, ice manufacturing, pharmaceuticals and quick freezing applications,is a natural fit for a natural gas refrigeration system. Its reliability and economical value make it the technology of choice. Engine-driven units use the same cooling process as electric systems, but a gas engine is used in lieu of an electric motor. Engine-driven units are environmentally friendly and are available in a variety of sizes from about 50 tons to several thousand tons of cooling capacity. Some engines can run up to 5,000 equivalent full-load hours between maintenance. The most distinguishing factor about natural gas industrial refrigeration units is their ability to cool to extremely low temperatures. On average, they reach temperatures 60° lower than conventional space conditioning equipment - as low as minus 10-20°F. The simplest cycle is a single stage compression cycle that consists of four elements: an evaporator, compressor, condenser and expansion device. At the evaporator, heat is absorbed from the hot source to the cold refrigerant causing it to boil. The low-pressure gas leaves the evaporator and returns to the compressor (A to B). The compressor raises the pressure of the refrigerant to a point where it can be condensed to a liquid by use of ambient air or other means (e.g. cooling tower water)to absorb the heat given off by thecondensing refrigerant. That allows the refrigerant vapor to condense at a relatively high temperature, permitting the use of ambient air or other means (e.g. cooling tower water)to absorb the heat given off by the condensing refrigerant. Heat removal occurs from points C to D. The high-pressure gas enters the condenser and leaves it as a high-pressure liquid at D. The high-pressure liquid is then throttled across an expansion device to deliver, at point A, a low-pressure / temperature liquid and a small amount of flash gas (to cool the remaining liquid), ready to absorb the heat from the object(s) to be refrigerated. Compound refrigeration cycles are the most common cycles employed efficiently providing refrigeration within the temperature range from -70°F (-56.7°C) evaporation temperature (ET) to -10°F (-23.3°C). Early compound refrigeration systems used two or more independent compressors, each with its own prime mover. 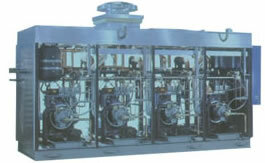 The advent of internally compounding, reciprocating compressors (by manifolding a bank of low-pressure [evaporator temperature] cylinders through an intercooler and into a bank of high-pressure cylinders) reduced the need for multiple compressors. The introduction of screw compressors to refrigeration in the 1960s dramatically changed refrigeration options. Screw compressors can easily accommodate side loads which have intermediate temperature requirements within a refrigeration system to provide useful cooling and improve cycle efficiency. A compound cycle requires less work input than a single stage system. Therefore, where economically feasible and operationally sound, compound systems are more efficient at medium temperatures and below. Compound systems can also accommodate two levels of cooling. Compound systems can incorporate an evaporator operating at the pressure level indicated by points G & H and by merely increasing the size of the high-stage compressor to accommodate the increased gas flow at point G.
A cascade system is utilized when there are operating and/or capital cost advantages to using two (or more) different refrigerants within the same system. Many supermarkets, for example, use two different refrigerants because the thermophysical properties of a low temperature refrigerant allow smaller components and lower energy input. These low temperature refrigerants exhibit low specific volumes at low temperatures. Compressor size and type are two of the major considerations that determine the best system design. Cascade systems should be considered when evaporator temperature reaches -50 or below, as the refrigerant characteristic variations begin to become extreme.